Driving or riding in an automobile car and having a bus crash into your car. If you are in bus accident, a claim may be filed against the bus company or the owner of the bus to receive compensation for your injuries. These losses may include medical expenses, lost wages, loss of earning capacity, pain and suffering, disfigurement and emotional distress. 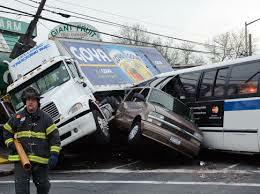 There is usually a statute of limitations for filing a claim when it comes to bus accidents or any accident. The sooner you contact an attorney and make a claim, the better. If you wait too long your claim can expire and you will not receive anything. We look forward to hearing from you soon and helping you.